Thank you for purchasing in our store! If need any help, pls contact us freely, we will find a best solution for you! A great gift for newborn baby, creating a lasting memory for your lovely baby! Suitable for family keepsake, baby shower gift and registry. Locisne Handprint and Footprint Ink Pads with "Clean-Touch" Ink Pad, and strong ink absorbency with no smear. This good design protect baby's skin without ink-touch,both environmentally friendly and safe. it's a great way to witness the growth of the baby and leave a memory of their childhood. Step 1: Take out the clean-touch ink pad and place pad, ink side down on the included white, imprint card. Step 2: Press baby's hand or foot onto the clean-touch ink pad gently. Step 3: Remove baby's hand or foot after the print is transferred onto the imprint card and let dry for 24-48 hours. Safe and clean: High quality environmentally friendly ink material, safe and non-toxic, not to fade or lose its definition. Smart ink-less touch design ensure that infants do not need to touch the ink, keep baby skin clean without ink safely. 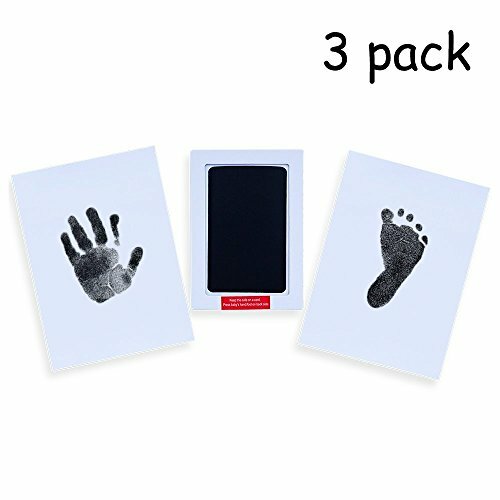 Great Fit: 3.4 * 4.8 inches, Three large ink pad could fit the hands or feet of most babies perfectly, 6 high quality imprint cards included, with strong ink absorbency with no smear. Easy to use: Just one press lightly, you could get baby's hand print and footprint easily. You can also use it to capture the paw print of a pet. Perfect Gift: Always remember the adorable size of your baby's hands & feet, give your baby a memory as keepsakes, best choice for new baby or registry gift item. Best Customer Service: If have any problems with our products or service, kindly please feel free to contact us, we will response and handle quickly, 100% money back guarantee.